Spreadsheet can easily be used to determine various scenarios or What If situations. By plugging in different numbers, the user can answer various questions without too much effort. This exercise illustrates the time value of money. That is how time helps an investment grow. To increase the value of your investment, all you need is time. The younger you are the more time is on your side. You will create three different scenarios to see the value of investing sooner rather than later. Below is the top part of a spreadsheet. the blue numbers are typed as numbers. The graph above is created just like the Rule of 72 graph, but more data Ranges (aka Series) will need to be selected. 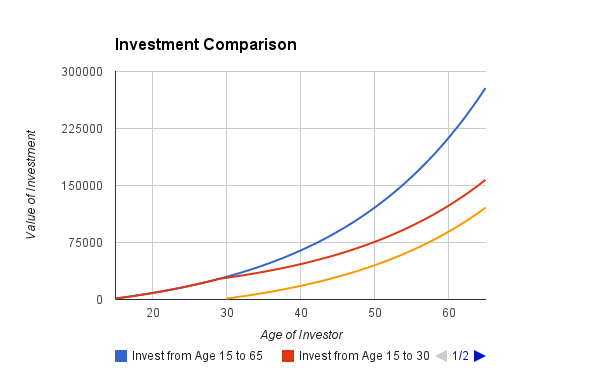 In each scenario, how much must be invested yearly to have $1,000,000 at age 65? Often as we get older, we can afford to save more. Assume in each of the original scenarios, the investor can afford to invest 5% more each year. How about 7%, or 10%. You may need to adjust how some of your calculations are done, but again if you do this correctly, all you will need to do is change one value in your spreadsheet and the entire spreadsheet will change. Let your curiosity get the better of yourself and create your own set of scenarios to compare. I hope you see that the sooner you invest your savings, the more you will have available late in your life.